Inserting microelectrodes into the enormous nerve fibers of the squid L. forbesi, physiologist Andrew F. Huxley and his colleague Alan L. Hodgkin studied the exchange of sodium and potassium ions that reverse the electrical polarization of an individual nerve cell. 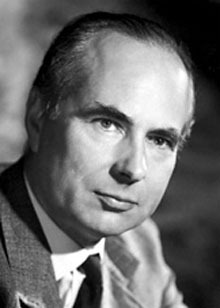 For demonstrating the chemical processes involved in transmission of nerve impulses, Huxley and Hodgkin were awarded the 1963 Nobel Prize in Medicine, sharing the honors with neurophysiologist John Eccles. Huxley also served as editor of the scientific reviews Journal of Physiology and Journal of Molecular Biology. His grandfather, Thomas Henry Huxley, was a noted 19th-century writer and biologist, and his father, Leonard Huxley, wrote a famous biography of the elder Huxley. His father's first wife, Julia Arnold, was a niece of poet Matthew Arnold, and the mother of Andrew Huxley's four half-siblings, including the biologist Julian Huxley and Aldous Huxley, author of Brave New World. His wife, Jocelyn Richenda Gammell Pease, was the great-great-great-great-granddaughter of pioneering English potter Josiah Wedgwood, and his niece, Angela Huxley, married George Pember Darwin, a great-grandson of Charles Darwin.